Serenity Now: Snowflake Silhouette Window and a Promo for You! I've you've been following me on Twitter or Facebook, you know I gathered up the courage to open my new Silhouette machine this weekend and try it out. 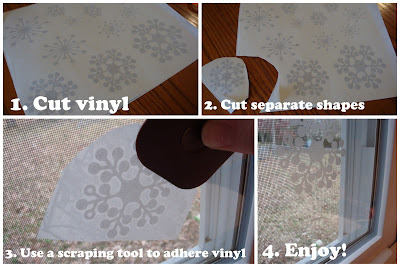 Today, I want to share a simple diy vinyl project and a really neat Promo that Silhouette is running this week. I purchased my own machine, but Silhouette sent me some vinyl to test out, and I thought the frosted vinyl looked just perfect for snowflakes. 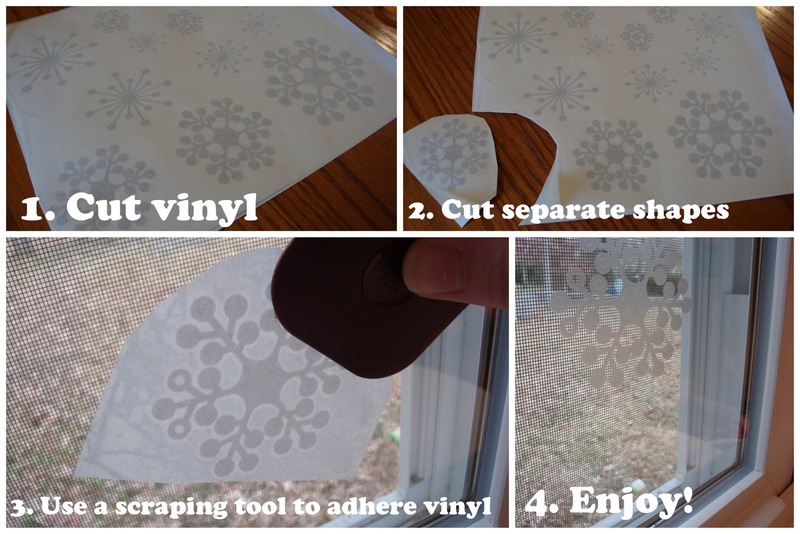 I decided to pair some vinyl Silhouette snowflakes with my pom pom snowflake garland on the window in our Addition. 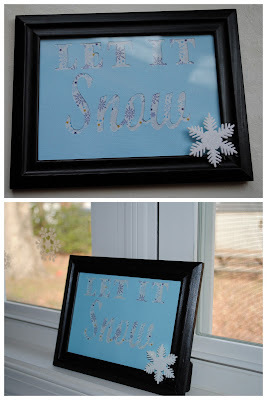 I wanted something simple to dress up the bottoms of the windows where the girls sit to color, so I used my Silhouette to cut some snowflakes with the frosted premium vinyl. It was cute, but needed a little something else so I typed up a wintery phrase in the Silhouette software and sent it print before sticking it into a dollar tree frame with a snowflake hot glued to it. Once I figured out how to work some with the software, it was pretty easy to use! I am really excited about all of the neat projects I'll be able to work on with my new Silhouette. And guess what?? There are two Silhouette promos running this week, from today until Saturday, the 22nd! 1. Purchase the Silhouette Machine Package for $225. This includes the machine, software, 2 rolls of premium vinyl, 1 roll of transfer paper, and the Home Decor Cd. That's a value of $395! If you've been considering purchasing your own Silhouette, this is a pretty fantastic deal. Use the code SERENITY at check out for your discount! 2. Purchase any premium vinyl for 25% off! Use the code SERENITY at checkout for your discount! I have another fun and easy Silhouette project to share with you later this week, and I'll be back tomorrow to show you how to make the world's best café mocha! 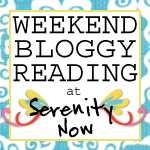 Lots of exciting things coming up here at Serenity Now. Love it! I predict that you are going to have a lot of fun with this machine! love the window! i have been so uncrafty lately-so many projects i want to get started on! can't wait for the cafe mocha-yum! I really need a silhouette. Darn it. Wish you lived closer! I haven't gotten brave enough to open mine yet! How can a little piece of technology freak me out!?! BECAUSE it's TECHNOLOGY! I will open the box today and at least read the instructions. Your window is cute! I bet the girls love sitting there to color and look outside and to have it all prettied up for them! That is so cute! I've seriously got to get a Silhouette or a Cricut. 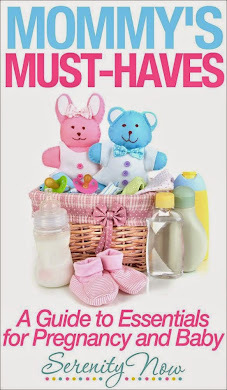 You can make sooo many cute things! Oh, that is sooo cute!!! I want one! *said in a whiny voice* :-) Love it! LOVE how it turned out! And I am soooo super jealous you have one. I can tell you're just getting started having fun with this machine! The snowflakes are so cute! I love the little snowflakes. They're really subtle. A really nice touch. PS - Love the name of your blog!